Jaigarh Fort was the treasure house of Maharaja Man Singh I. All the silver, gold and precious gems won by the Maharaja and his successors during the war were kept here and were guarded by the loyal Minas (a tribe of Rajasthan). Later this treasure was invested in building the cities of Amber and Jaipur. Local people say that some of the treasure is still buried somewhere in the fort. “A fort is the strength of a king” is a saying in the ancient Hindu Scriptures Puranas and while building the fort it seems that it was clearly etched in the mind of the Maharaja and his sons. Later, new additions were made to the fort and it was also amended by Jai Singh II. After that, the fort could never be conquered by any ruler. 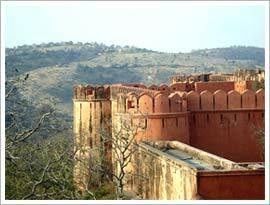 Jaigarh Fort is popularly known as the 'Fort of Victory'. It is located atop Chil ka Tola or Hill of Eagles. The fort has two entrances. One is Doongar Darwaza and Awani Darwaza. After entering the fort the first thing you must head for is the biggest cannon in the world, Jaivan. Weighing around 50 tons, this cannon was never used. Thank God! But it was once tried by Jai Singh in the year 1720. After firing, the canon ball fell at a distance of 38 km from the fort. As a result of this, a lake was formed there. You can imagine how powerful it was. The fort has several beautiful buildings such as lavish palaces, granary, armory, museum, meeting hall of warriors and temples. It has three huge underground water tanks which were a great source of water during the bygone era.